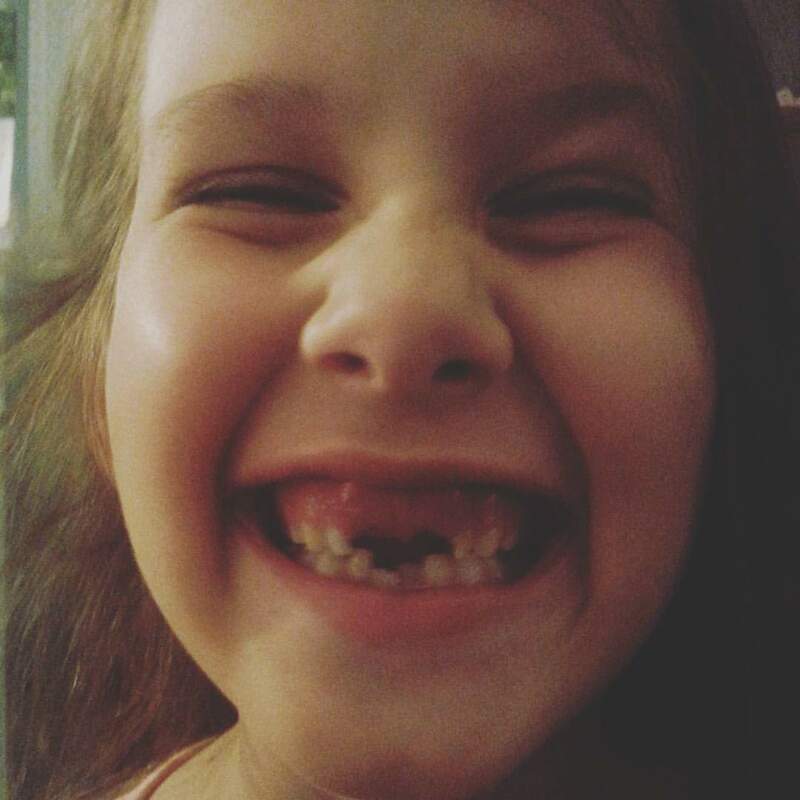 Stella had been wiggling another loose tooth for a few days. Yesterday, she got off the school bus with that tooth just hanging there, sticking out, and looking crazy. I really wanted to just yank it out, but she is a bit stubborn and had to do it herself. That tooth survived an afternoon snack and dinner! Finally, just before bed she went into another room and pulled it out. This is the smile of a little girl that is so proud of herself! Also, this is how big she was still smiling this morning. With school pictures coming up soon, we could have a very interesting first grade picture! Although school was back in session at the end of August, I wasn't quite ready (and I'm still not) for our summer fun to end. So, Labor Day weekend we took another trip to Gettysburg, Pa. We've been there a few times and still have so many more things to see and do. 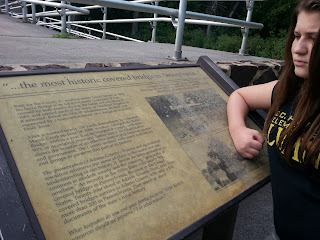 Surprisingly, the kids enjoy the history as much as Mike and I do! Sachs Covered bridge was one of the places we hadn't been to on our previous visits. 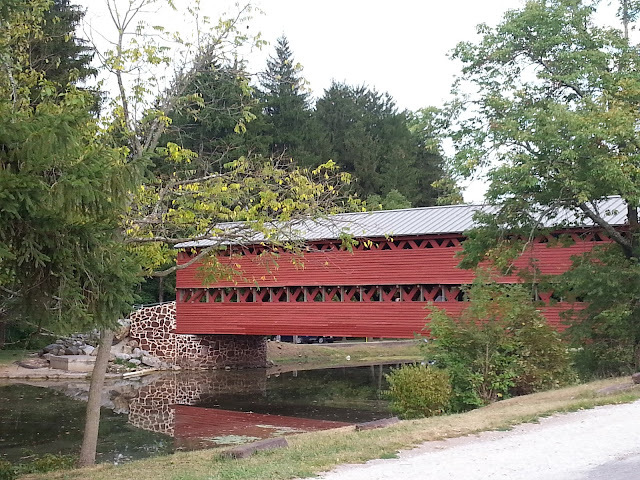 With many ghost stories floating around, we thought it would be fun to visit. It turned out to be one of the most peaceful places on our trip. The bridge itself is beautiful and the water was so calm. 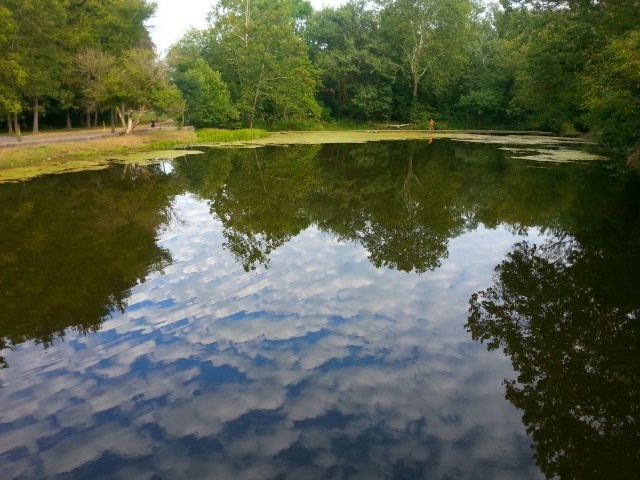 The trees and clouds reflecting off the water was just gorgeous! I'm not sure how I would feel about visiting at night, though. Maybe we'll save that for another time when the kids aren't with us. 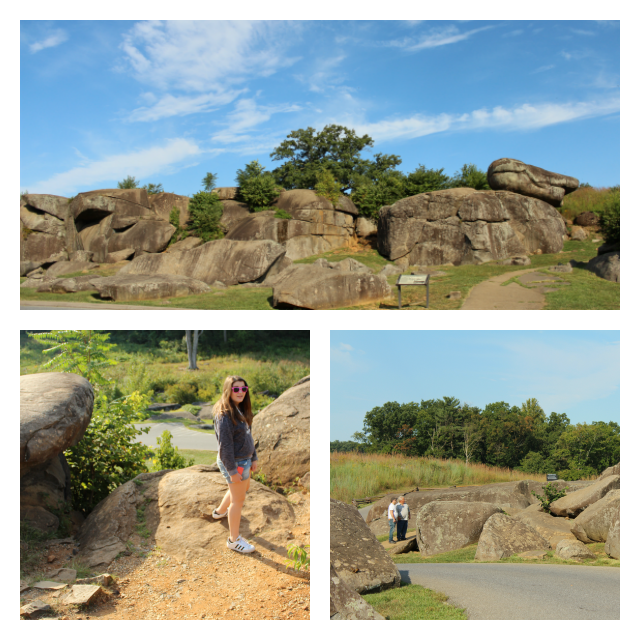 One of favorite places in Gettysburg is Devils Den. The girls could spend all day climbing the rocks and imagine what it was like for the soldiers who fought there. 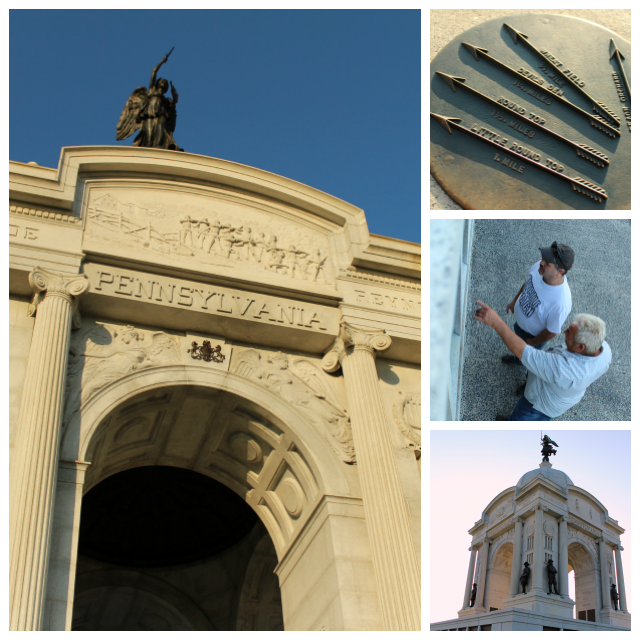 The Pennsylvania Memorial is another favorite stop. Mike and my Dad spent a good amount of time searching through the list of soldiers names looking for our ancestors. Touring the battlefields was the perfect way to spend the weekend and we especially enjoyed having my parents along with us. They took us to a few of their favorite places as well. I'm sure we'll be heading back again sometime soon! Summer break came to an end a few weeks ago and apparently, I'm still in denial over it because until now, I haven't posted first day of school pics! 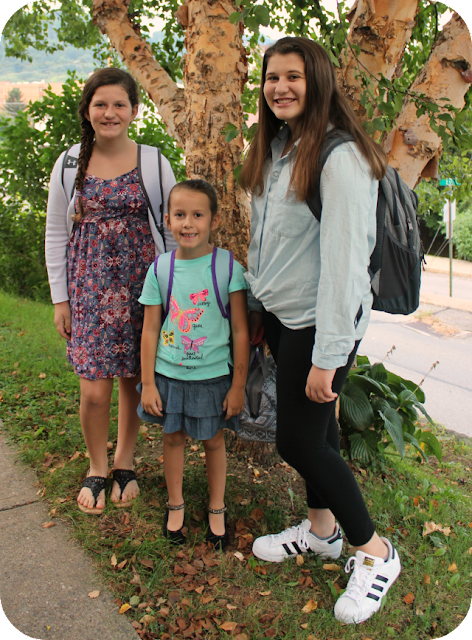 So, here they are, The Adams girls starting out another year of school! It's hard to believe how much these girls have grown. I mean really...my BABY is in first grade already! Crazy! Being home alone when the girls are all in school and their big brothers are all at work is very quiet. Most days, I am very busy with the everyday chores of being a mom, but there are some moments that I actually have "free time". These are the moments that I have no idea what to do with myself! I suppose I should just enjoy the quiet, but it's not always that easy. I think I need to find a hobby! HA! Of course, when the day is done and I pick them up at the bus stop, the silence is broken and the witching hour begins. I must say, I dislike homework just as much as an adult as I did when I was a kid. Booo! But, so far our school year has gotten off to a great start. Hopefully it continues!